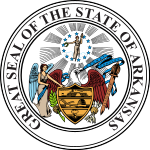 The 1980 United States Senate election in Arkansas was held November 4, 1980. Incumbent Democratic U.S. Senator Dale Bumpers won re-election to a second term. This Arkansas elections-related article is a stub. You can help Wikipedia by expanding it.